Prestigious international affairs and business news weekly The Economist, has quietly dropped the pay wall on their mobile edition. The mobile site which used to cost $7.95 a month is now completely free. 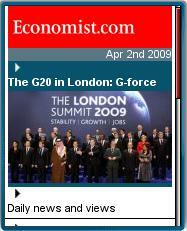 The Economist Mobile includes a selection of articles from the paper’s main on-line site and the print edition. There are typically around 50 articles on the mobile site divided into News, Politics, Leaders, Business, Science and Technology and Business Travel sections. Most articles include single mobile sized image. The site’s design and layout is generally pretty usable in phone browsers. Page size is under 20 KB and scrolling is minimized by the hierarchical menu structure and giving each article its own page. There is no forced redirection to the mobile site so users of full-web mobile browsers like Opera Mini and Bolt can also view the full Economist.com site without much difficultly. This entry was posted in News Sites and tagged News Sites, The Economist by Dennis Bournique. Bookmark the permalink. Great to see. Economist is always good reading.